I grew up in Pennsylvania and have been drawing since grade school. War scenes, dinosaurs, & dragsters (the big three). I liked the horror comics of the 1960s and 70s, and was really influenced by all the fantasy illustations and music of the 1970s. My family moved to Daytona Beach FL. in 1971. I became a skateboarding surfer dude. 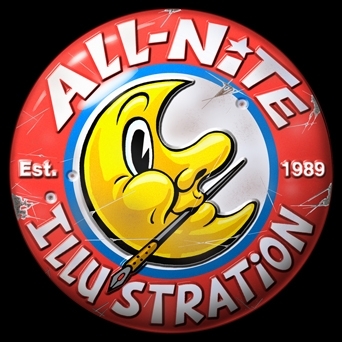 Started airbrushing t-shirts in 1979 and have been able to make a living with my drawing ever since. While at Ringling College of Art in Sarasota FL. I did hand separated silkscreen illustations for an apparel company. After school my wife and I moved to Dallas TX. There I airbrushed at an advertising illustration studio called Cat Pak. This was all before computers. I went freelance after moving to Nashville TN. in 1989. Starting in advertising and slowly moving into the children's market. I work on a Mac now and use Photoshop, Painter, and Illustrator. I am not tied down to any one style and enjoy trying new things.